Hiya lagoon! Pintip Mermaid here to talk to you about my favorite writing places…. Most productive place I’ve written: in the car, at the parking lot library, for eight entire hours. Two words: no distractions! Most chaotic place I’ve written: Today! At the kitchen table at my friend’s house, with five kids, one toddler, and one dog running around, making slime, eating lunch, and playing games — one with pink eye, one with a broken collarbone, one with a stomach bug, and one with a bruised pinky toe. The injuries weren’t my fault, I swear! Place where I’ve written the longest number of consecutive hours: on the airplane to Thailand (which includes the layovers). I wrote for 20 hours straight. Oh, and guess what? 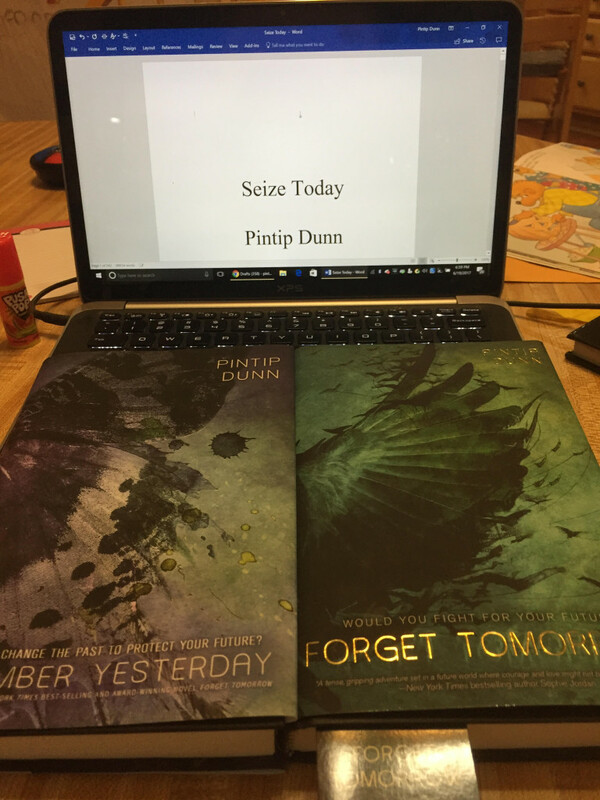 This is unrelated to the post, but I just finished my second-round edits for SEIZE TODAY, the the conclusion of my FORGET TOMORROW series!!!! WHEEE!!!!!! What are your favorite places to write? Let me know in the comments below. I can’t wait to hear!!! Great post, Pintip! I can’t believe you wrote for 20 hours straight! I can’t even imagine. Congrats on finishing the edits. What a relief that must be! Pintip, I can’t even imagine! You are an inspiration to the “lazy bums” in our lagoon! Pintip, I love how you broke your post down into categories. That is very cool! Just like you. I think the thing I love most is that you find ways around anything that pops up in your path and you write. It shows your love and dedication. I hope your writing brings you as much happiness as it does to your readers. Love you, friend. Fun post, Pintip! I loved your breakdown. I can’t believe you wrote for 20 hours straight. That’s crazy stuff. haha.